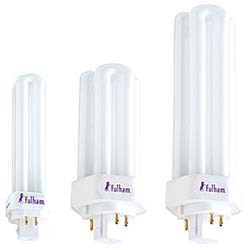 Fluorescent lamps are available in either 4-pin compact fluorescent or linear models. CFLs are flare sealed with a built-in "safety fuse" to protect against overheating of the base and lamp holder. CFLs are available in standard color temperatures ranging from 2700K to 5000K, with custom colors available up to 6400K. Linear fluorescents are available in configurations from T2 to T5 VHO (very high output). Linear fluorescents range in wattage from 6 to 95 and are available in same color temperatures as CFLs.